Daycare, Mommy's Morning Out programs, in-home sitters, and mother's helpers are common suggestions that can take a huge weight off of the busy at-home mom and allow us a bit of peace in a day. But what do you do when the daycare cost is too high to add another day and there just isn't' enough time? I rush through work tasks during baby's time away from home. It is never enough time. More often than not, I am leaving something hanging because I ran out of time; and it nags at me for the rest of the day. Despite my desperate desire and good intention to hit "send" on that project and check it off of my to-do list... sometimes it just does not happen. In addition to suggestions to hide in a closet and shed a tear and/or downing a bottle of wine, many of these at-home moms suggested sharing childcare duties with playgroups. Getting together with moms in a similar situation can be beneficial by providing adult interaction, a compassionate person/people to lean on, and a welcome change of pace for the children. My little guy cried and fussed all morning but he perked right up when a friend came to my rescue with her three-year-old in tow. His monotony was broken up with different people and youthful play and I chatted with my friend and got my mind off of the tasks that should have been done. Curing isolation with friends who understand is probably the best trick in the parenting book. It works. If it puts me 30 minutes behind on work? It's actually okay - because I am more refreshed and less anxious. I can tackle my task afterward with a much better and less frazzled attitude. Thanks to my plea online, I pushed myself to text a friend. Thanks to that compassionate friend, our bad morning turned around. And thanks to the online mamas who let me lean on them, a Mama's Night Out is being planned as we speak. 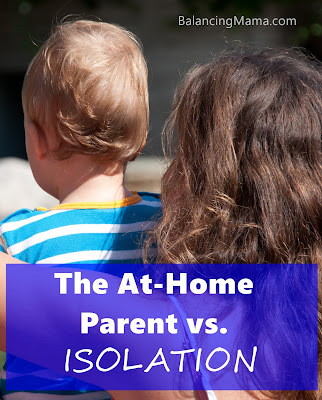 So here's the moral of my story... don't let parenting isolation drive so much anxiety that you feel like you have no one. Don't allow it to fill your head with excuses. Don't let it tell you that you can't be a good mom who also takes care of herself. Alleviate the isolation of parenting by reaching out to others. Moms can be crabby to each other sometimes, but the right kind of mom friend can really save your life. special to love someone more than herself."